Gerda is a Nord who works as a maid in Dragonsreach. 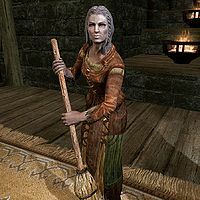 Gerda works alongside fellow servant Fianna and they are both tasked with sweeping the floor in Dragonsreach, specifically the waiting area near the entrance. At 8am, Gerda starts sweeping the southeastern area, while Fianna sweeps the adjacent area. At 2pm they switch places and keep sweeping until 8pm when they head down the stairs to their humble rooms in the jarl's quarters. They spend the entire night eating or relaxing, despite the presence of beds in their quarters (see bugs). Gerda wears a set of farm clothes along with a pair of boots. She wields an iron dagger and carries a selection of lower-class items and gold. Like Fianna, Gerda also takes her work seriously and she may sometimes say, "I might just be a servant among lords, but don't think for a moment I don't take my duties as seriously as the jarl himself takes his!" She can also be heard saying, "If my cleanin' gets in your way, just say the word an' I'll be off." and also, "This here is Dragonsreach, an' it's my task to see it looks fit for a jarl, night an' day." Gerda was supposed to sleep from 8pm to 8am, but her sleep package mistakenly includes other activities, causing her to stay up all night. This page was last modified on 12 December 2013, at 23:22.